Topically organized and procedurally driven with descriptively-titled section headings and checklists for ease of research. 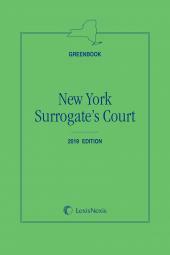 LexisNexis AnswerGuide: New York Surrogate's Court is topically organized and procedurally driven with descriptively-titled section headings and checklists for ease of research. 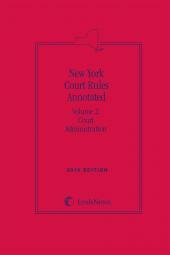 It cites seminal cases and precise references to codes and court rules. LexisNexis AnswerGuide: New York Surrogate's Court also directs the user to in-depth analysis and forms coverage via "Practice Resources" in each section. 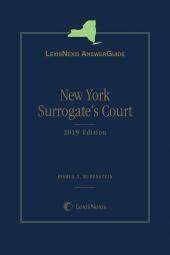 References to titles such as Warrens' Heaton on Surrogate's Court Practice, the authority cited most often by the Surrogates themselves, and Bender's Forms for the Civil Practice, which includes all official forms of the New York Surrogate's Court, take the user directly to a relevant section or form. LexisNexis AnswerGuide: New York Surrogate's Court also provides access to public records (e.g., locating an out-of-state beneficiary) by way of sample online searches easily modified to suit the user's needs. The title is replete with checklists and features 170 practice pointers—Strategic Point, Timing, Warning, and Exception—that ensure best practices and help avoid practice pitfalls. Joshua S. Rubenstein is national head of Katten Muchin Rosenman LLP's Trusts and Estates practice and national chair of the Private Client Services group. 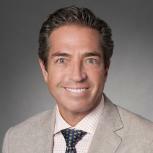 He also is a member of the firm's Board of Directors and the Diversity Committee. Josh advises businesses and private individuals, including high net worth individuals, senior executives, professionals, entrepreneurs, artists and others with unique intellectual property interests. He handles a wide variety of private matters for these clients on a local, national and international level, including personal and estate planning, the administration of estates and trusts, and contested Surrogate's Court and tax proceedings. He has counseled clients in trust and estates matters for more than 30 years, building relationships with those who value and rely upon his advice. He is a popular choice among clients for ''complicated multijurisdictional trust and tax work'' and is regarded as a ''pragmatic technician'' who ''will cut to the chase'' (Chambers USA). Josh's clients say he is ''a real polymath - not just a great lawyer, but a great chap to deal with and a safe pair of hands,'' adding that he is ''very able technically and very user-friendly'' while also being ''very good at getting down to the essence of what needs to be resolved and getting it done'' (Chambers USA). Globally, he is ''very highly rated for his cross-border work and is very active on the international trust scene as the treasurer of the International Academy of Estate & Trust Law'' (Chambers Global). He focuses on creating sophisticated, yet uncomplicated, solutions for clients. Josh finds unforeseen problems and uses an interdisciplinary approach to resolve those problems, bringing in members of teams that deal with taxes, real estate or corporate and other transactional areas of the law, as necessary. Josh is a former adjunct professor at Brooklyn Law School and is a frequent lecturer and author. He is regularly quoted in the media, with credits in The New York Times, The Wall Street Journal, New York Law Journal, Citywealth, Forbes, Kiplinger's, Crain's, The Washington Post, FOX News, Bloomberg News and CNBC. The Katten Trusts and Estates practice has earned recognition from Society of Trust and Estate Practitioners (STEP) for Best North American Private Client Team (2011, 2012) and from Citywealth for International Law Firm - USA (2012, 2013) under Josh's leadership. Clients note that within the Trusts and Estates practice, Josh is ''spectacular'' and ''clearly the star of the Trusts and Estates team'' (U.S. News - Best Lawyers(R) ''Best Law Firms'').